The opportunity to present the physics of radioactive processes in some detail apart from topics such as instrumentation which conventionally compete with it for spacer is most welcome. 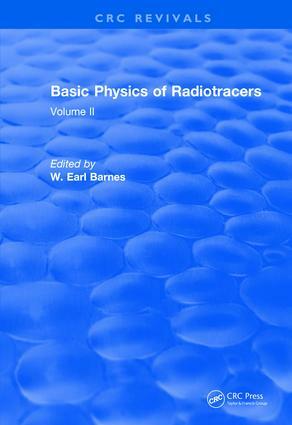 The material is intended to give a fairly complete introduction to radiation physics to those who which to have more than a descriptive understanding of the subject. Although it is possible to work one’s way through much of the subject matter without having any previous physics background, some prior acquaintance with modern physics is desirable. A familiarity with calculus and differential equations is also assumed. Volume I begins with a brief description of classical physics, it’s extension to special relativity and quantum mechanics, and an introduction to basic atomic and nuclear concepts. A thorough discussion of atomic structure follows with emphasis on the theory of the multielectron atom, characteristic X-rays, and the Auger effect. Volume II treats the subjects of nuclear structure, nuclear decay processes, the interaction of radiation with matter, and the mathematics of radioactive decay. Volume II Chapter 1 Nuclear Structure. Chapter 2 Modes of Nuclear Decay. Chapter 3 Interaction of Radiation with Matter. Chapter 4 Mathematics of Radioactive Decay. Index. W. Earl Barnes, Ph. D., is Physicist at the Veterans Hospital, Hines, Illinois. Dr Barnes received the B.A. degree from Harvard University in 1961 and a Ph.D. degree in nuclear physics in 1970 from Oregon State University. In addition to a teaching program in physics, he is engaged in research which applied mathematics and physics to various problems of medicine.